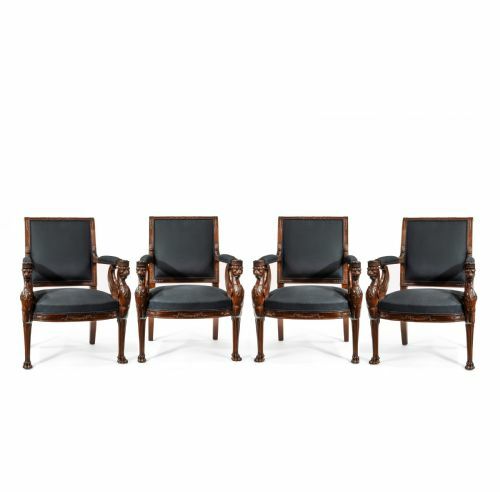 An extremely fine and well executed set of four, carved mahogany Empire period open fauteuils, upholstered in a black calico, by repute from a Royal collection. 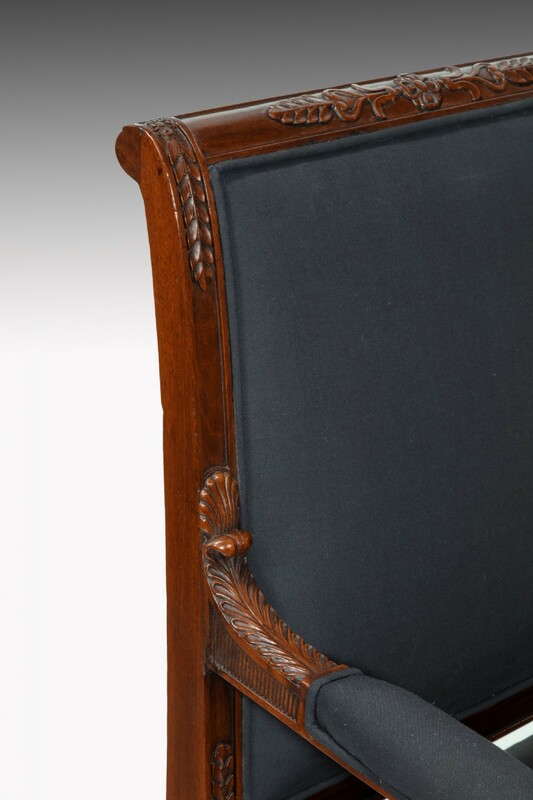 The gently raked, out-scrolled rectangular backs, with mahogany cresting rail centred by a carved rosette flanked by laurel trails, enclosing an upholstered back with single piped edge, above a pair of delicately carved foliate arm-supports, with padded upholstery, terminating on carved rosettes. 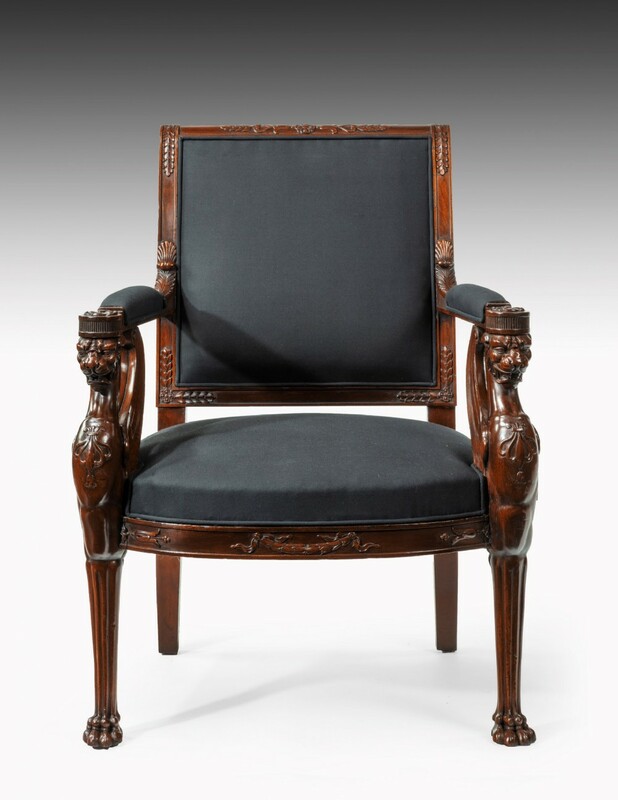 The crescent shaped sprung seats, central by a laurel garland and lipped edge, upholstered conformingly in a black calico with stitched front edge. 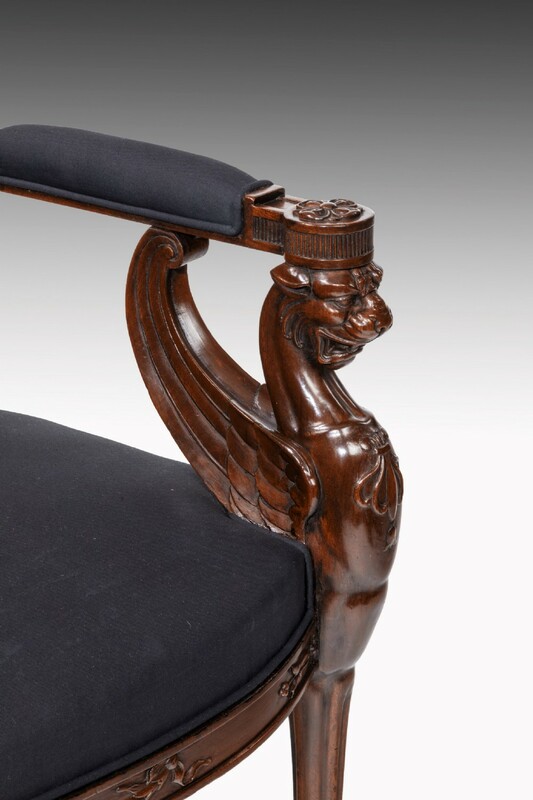 Raised on wonderfully crisp and detailed winged mahogany lion monopodia front supports, the breast with a carved anthemion motif, terminating on lion paw feet. The rear legs of splayed and tapering form. Standing boldly and late neoclassical in design, emitting the flare of the French Empire period, this delightful and important set of four fauteuils / armchairs, rarely seen on the market, are presented in excellent condition, recently finely reupholstered using a traditional hand stitched method. We have rarely seen a better quality and detailed carved lion monopodia which is one of the most desirable emblems in antique furniture. Design: The Empire style of architecture and furniture, named after the French Emperor Napoleon I, was conceived by Charles Percier (1764-1838) and Pierre Francoise Leonard Fontaine (1762-1853), whom were leading French architects and official architects to the court of Napoleon, their main responsibility was the renovation of the various royal residences. Their Recueil de décorations intérieures (1812) was an essential handbook of the Empire style. The excavations of Pompeii and Herculaneum in the mid-18th century, along with Napoleon’s expeditions to Syria and Egypt in 1798-1801, in which a military mission was followed by an archaeological expedition, where were inspiration was drawn. The Egyptian motifs and findings, on Napoleons mission, where returned and incorporated into the designs of Percier and Fonaine. The emblem of a winged lion was intended to idealise Napoleons leadership and the French state. It was from France this classic design spread throughout much of Europe and the United States, with Percier and Fontaine known to have influenced leading designers of the English Regency period, with the likes of Henry Holland (architect to the Prince Regent), Charles Heathcote Tatham and they were also known as close friends to Thomas Hope. The Regency period of design was long termed ‘English Empire’ which indicates its debt to France. 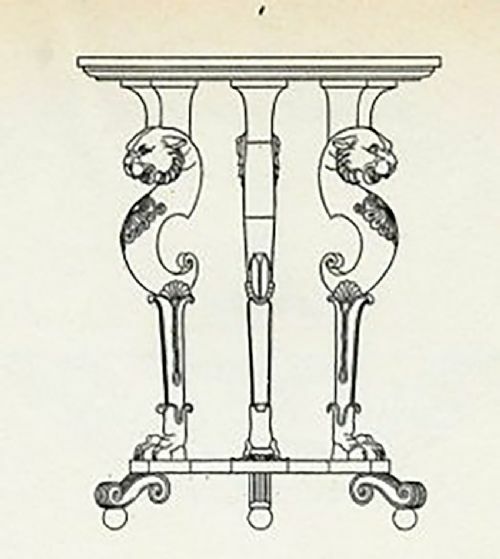 Charles Heathcote Tatham published Etchings, Representing the Best Examples of Ancient Ornamental Architecture; Drawn from the Originals in Rome, and Other Parts of Italy During the Years 1794, 1795, and 1796, in which he illustrated an antique tripod table with similar monopodiae of leopard heads and paws, based on the original in the Vatican. Thomas Hopes furniture is highly desired, due to its detail and execution of design. 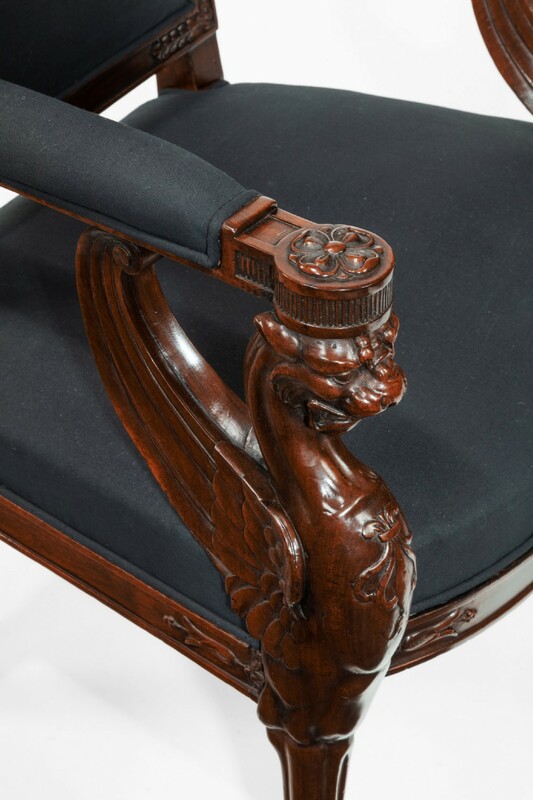 There are many similarities in detail to winged monopodia legs from this set of fauteuils and designs in Thomas Hopes book ‘Household Furniture and Interior Decoration’. 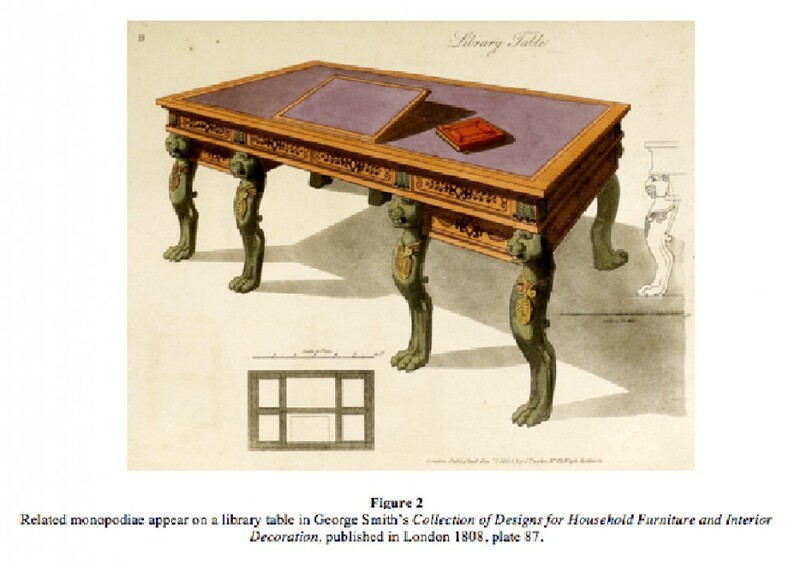 Similarities in design and features can be seen on the tripod table with monopodia legs, published in ‘Household Furniture and Interior Decoration Executed from Design, by Thomas Hope.’ Reprint of 1807 ed.,1970, plate 32. 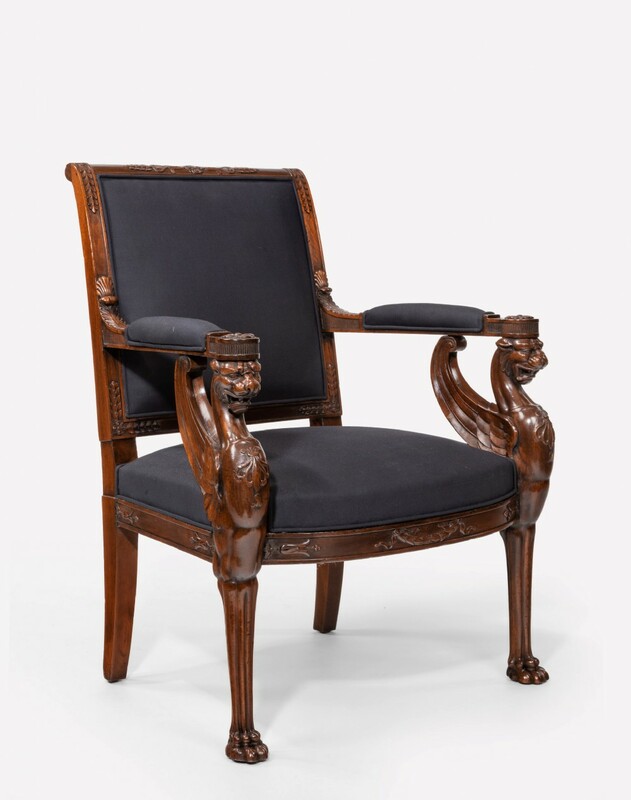 Royal Provenance: These chairs are by repute to have been housed in the Hermitage at Klampenborg, Copenhagen. 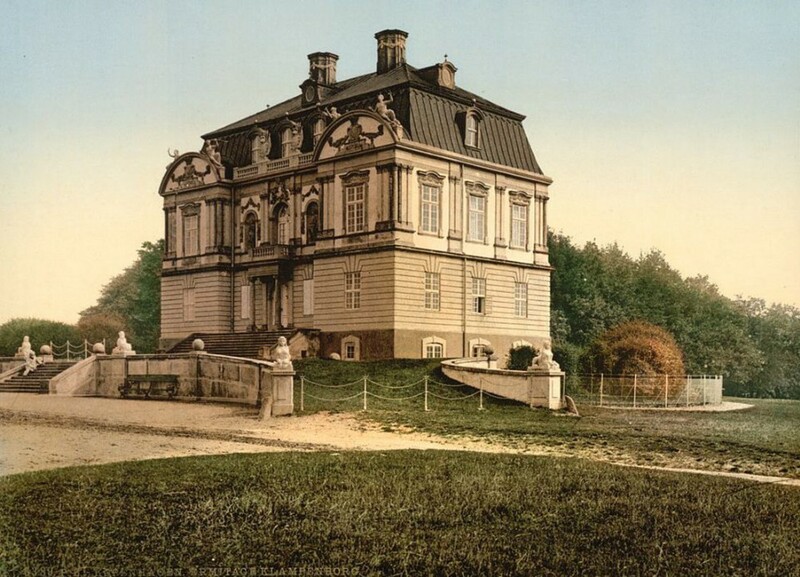 The hunting lodge was built by architect Lauritz de Thurah in Baroque style from 1734 to 1736 for Christian VI of Denmark. Never intended for residence, the Hermitage Hunting Lodge was built as a setting for hosting royal banquets during hunts in Dyrehaven, which surrounds the building. Loveday Antiques is a family run business originally established since 1969 in London. 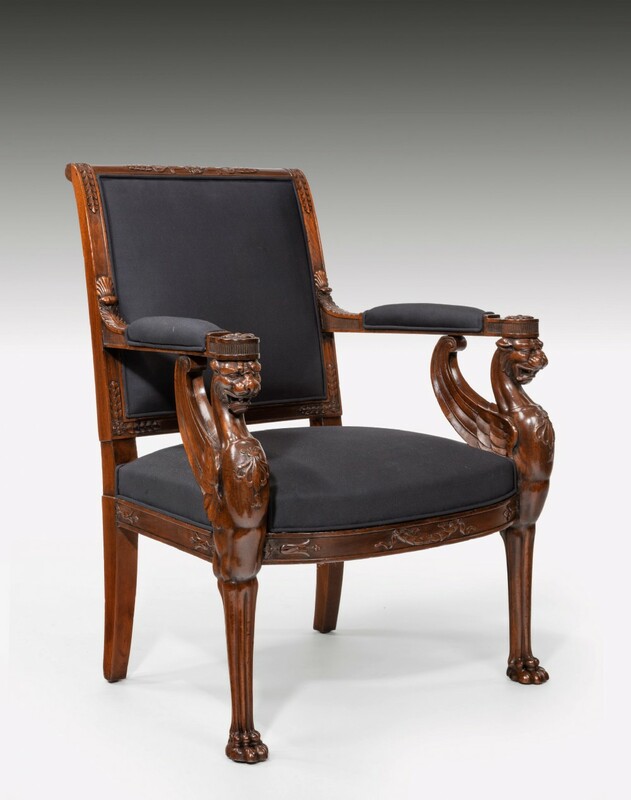 Now in its second generation, Loveday Antiques specialises in an eclectic mix of 18th to 20th Century European furniture and works of art, with a strong emphasis on quality, uniqueness and colour. As proud members of LAPADA, the largest association for professional art and antique dealers in the United Kingdom and members of CINOA, the worldwide association for antique dealers you can buy from us with 100% confidence and reassurance as we are committed to upholding and abiding by the strict standards of each association. All Items are sold with 100% satisfaction 14 day money back guarantee, return delivery will be charged for. We deliver within the UK for usually between £60-£80 and ship worldwide with professional bespoke crating via air to almost all locations. 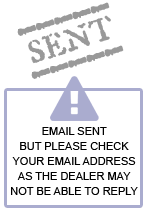 Please contact us at Loveday Antiques with your full postal address for a very competitive quote. Delivery within the mainland UK will usually be with 7 to 14 days but please allow up to 28 days. We also ship worldwide with a professional bespoke crating service and large International couriers via air and sea to almost all locations. Please contact us at Loveday Antiques with your full postal address for a very competitive quote. All items listed are in excellent condition having been restored using traditional methods by experienced cabinet makers and polishers keeping the original colour and patina wherever possible. Please bear in mind you may find the usual markings with antique furniture that are commensurate with age which all add to beauty and uniqueness of the item. 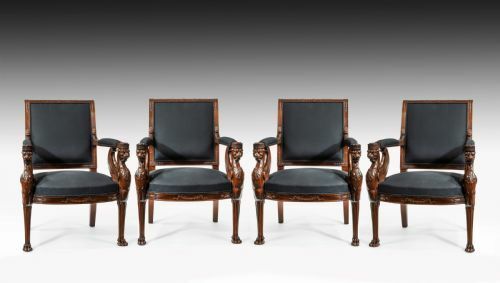 We have a reputation for being long established antique dealers in London having had showrooms concurrently running in Islington, Chelsea and Ascot. We have relocated our new showroom, due to London overheads, easily reached between A1 or A10 to just outside of Hertford, Hertfordshire. We will happily arrange for clients to be collected travelling via train. Local stations being Hertford North, Stevenage and Ware, all being a 10 minute drive from us. Please contact us for location and appointments. Payments accepted are Bank Transfer, Cheque, Major Credit Cards or Cash. We have more than 40 years experience in supplying Antique furniture to the trade, public and interior designers from all parts of the world so please buy with confidence as we have passed the test of time. 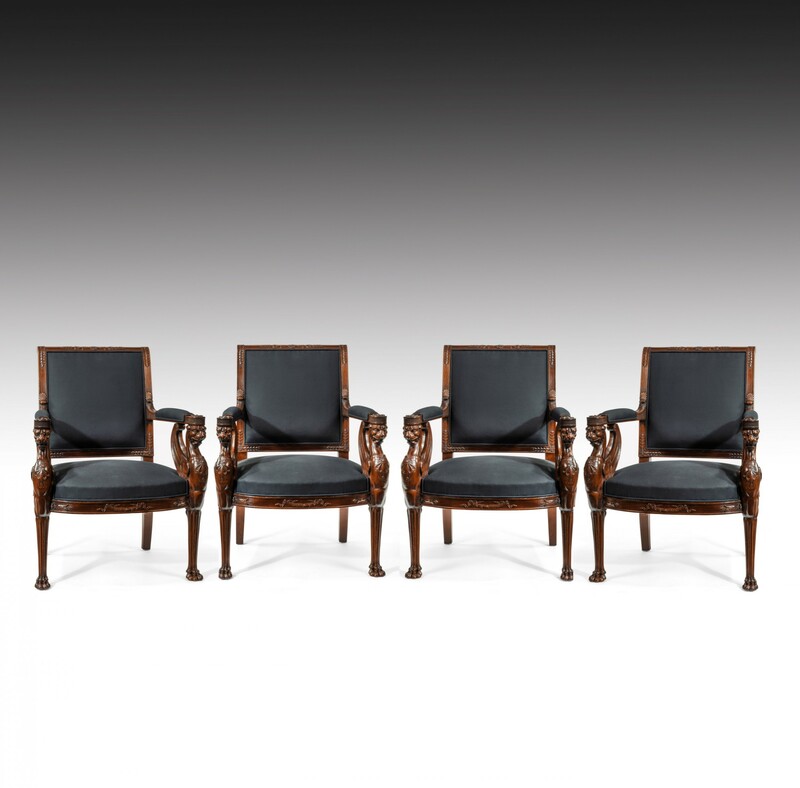 The Fine Set of Four Empire Period Mahogany Fauteuils has been added to your saved items.